Protest Against Illegal Immigration in Westminster, California | Stop Obama Now!! California is quite literally being colonized by Latino Nationalists and their traitorous socialist political stooges in government. A pillar of his plan to destroy America, Obama subverts the immigration law by executive dictate. As California goes, so goes the nation. The CCIR has been fighting back against the odds for decades. California is currently preparing to issue drivers licenses to millions of illegal aliens, which will be valid anywhere in the country. This will make it much easier for illegals to work throughout in the US and greatly increase the flood of illegal aliens into the entire country. 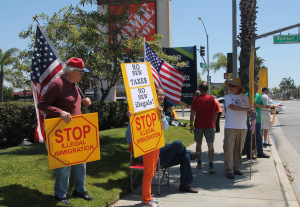 This protest against illegal immigration took place at the Home Depot in Westminster, California in Orange County on May 3, 2014. The event was organized by the California Coalition for Immigration Reform (CCIR).